Red Balau, is both strong in the face of harsh weather conditions and lovely to admire. It is similar in colour to mahogany and requires very little maintenance. It is mainly used to build fences, decks, bridges, docks and boardwalks. Red Balau flooring is also available which is equally beautiful. The wood is naturally insect, fire and decay resistant so it is the perfect choice for any outdoor structures. It is also resistant to scratches, dents and abrasions which is another testament to its durability. It can thrive in any environment from dry and hot to humid and tropical. It is very similar in price to other hardwoods as well as composite plastics. The best way to maintain this heavy duty material is to treat it annually with Messmer’s CV Plus finishing oil. This will keep the wood looking rich and brand new. If the lumber is not treated regularly it will weather itself into a silver patina. Treated or not, the material will maintain its beauty and structural integrity for 30, 40 or even 50 years. It is a rarity to find Red Balau Batu that has any knots, holes or odd colors. The wood has a dense grain with a nice, even texture which is great for applying finishes. 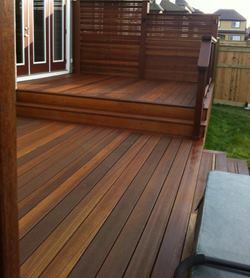 The grain is very tight which is pleasing to the eye and it will make any room or deck look sophisticated. Even though the lumber has a high density it is still easy to work with. Pre-drilling all holes in the wood before using stainless steel screws is strongly recommended. 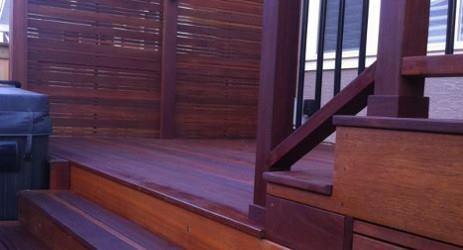 The Kreg Deck Jig is highly recommended for all deck installations. Red Balau Batu has a very similar look to mahogany but has deeper red undertones that make it stand out from any other type of lumber. It is prized for both its stability, durability and lush colors. Even with little care or maintenance, this material can last for many years.